2. . . . The occasion demands that I speak poetically. And if I sing to those that understand, then you that are profane, shut the doors on your ears! [Ed. note—‘This line was borrowed (directly or indirectly) from an Orphic verse.’] . . .
3. There are those who perform sacred and secret rituals that cleanse blemishes from the soul. When these celebrants have all joined together in full assembly and are about to bring forth into open view, as from the silent innermost shrines, the objects of the divine and most sanctifying rites—secret, mystical, belonging to the Godhead—they would never perform such a revelation in front of the general crowd, where the unitiated are mingling about. There would be the chosen one of the ministry—who is just beneath God’s higher and intimate choir—standing like an incense-bearer outside the sacred gates of the most sacrosanct. And with a great command he separates from the chaste objects those for whom it is the custom to mock such things. He himself is in fear of him by whom the dirty attendant was cast away as far as possible from the joy of the wedding reception, because he had not put on clothes appropriate for the divine banquet. Since this is so, when we come responding to his invitation, we do not hang our hopes on eloquence, sweet stories, the idle chatter of philosophical discussions, or rhetorical devices. And we do not come arrayed in wild iambic verses, which do no one any good. For along with Christ, we have a fellow traveler who says that the wisdom of the Greeks makes nonsense of the cross, but is itself stupidity. We are discussing divine Scripture, which was presented by a man with a weak voice and sluggish tongue yet which has been universally confirmed and cherished by country folk, farmers, fishermen, cobblers, and the illiterate. It has embarrassed the clever. It has shown them to be morons and useless. It says the following: In the beginning God made the heaven and the earth. It uses the name heaven collectively for all the heavenly and spiritual arrangements: both of the holy forces and of the spiritual order. Thus, you must consider first the cosmos above. 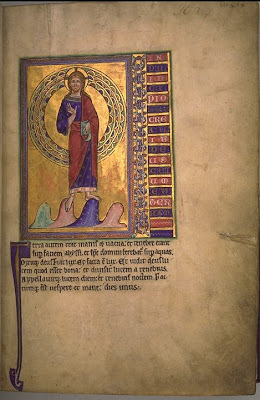 This was created—as the theologian says—in the following way: ‘First he takes thought of the angelic and heavenly forces; and the thought was a done feat.’ Then it uses the name earth for this perceptible and visible world, collectively with its own heaven, and all the things upon the earth along with man that have come into being and exist, both animate and inanimate. So by saying In the beginning God made the heaven, it raised your mind up to the creation of the whole arrangement above. Then by introducing and the earth, it brought your mind down to the establishment of the fulfillment below. And through a part—I mean the earth—it presented to you the whole compass. It used synecdoche, so that you recognize not only the earth, but also its surrounding heaven. Thus in two phrases, in one definition, it encompassed the act of creating and the creation itself of both the spiritual world and the visible world. And God did his creating in the beginning: that is, in his paternal beginning, which is the Word. For all things came into being through him and in him. Have you read "Beginnings: Ancient Christian Readings of the Biblical Creation Narrative," by Peter C. Bouteneff (Grand Rapids, MI: Baker Academic, 2008)? If not, I'd be happy to send it you way. I have not read this, and I would be very interested and grateful if you did send it! Excellent! Please send your mailing address to me at bishopsavas@goarch.org.